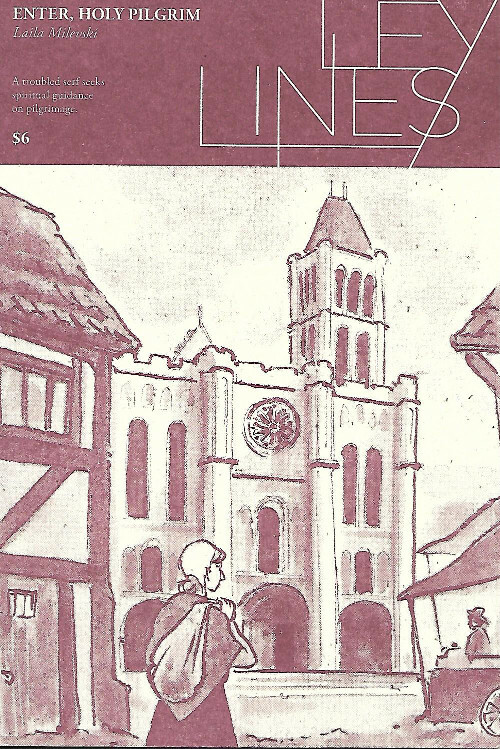 This week I’m featuring a recent release from Czap Books and Grindstone Press; Ley Lines #9, Enter, Holy Pilgrim. Yesterday we started with a review of the book; today I sit down to interview Laila Milevski, the creator, to talk about her inspiration and her thoughts about the creative process in working on a Ley Lines book. You can read my review of the book, which was published on Monday, here. This interview was conducted over email. It was edited for flow and readability. Alex Hoffman: I wanted to start with the inspiration for Enter, Holy Pilgrim. Most of the cartoonists who have done a Ley Lines issue have paired their comics with an artist, generally an artist who works in the visual space. Why did you chose gothic architecture as your inspiration? Laila Milevski: Since the time that I first heard about the Ley Lines project, I had envisioned architecture as something I would want to explore and share with readers if I were to contribute to the series. I couldn’t think of one particular artist who I wanted to engage with through this medium, but at the time, I was very excited by the power of architecture. I chose Gothic architecture for two main reasons, those being that I have a personal history of extraordinary experiences in Gothic architecture, and in college I took an art history course examining spiritual parallels between Romanesque and Gothic church architecture in France with the French epics The Song of Roland and Tristan and Iseult. AH: If you don’t mind me asking, what were those extraordinary experiences? LM: The extraordinary experiences I mention were a handful of moments in which the combination of sensory stimuli and physical surroundings led me to feel something almost like ecstasy. What’s most important about these moments was that by being transported out of my day-to-day sensory experience, I was made to understand how the divine could be real and believable to the religious people around me. During my first of these moments I realized that I was experiencing “spirituality” and it completely changed my understanding and acceptance of that concept. That first time was in India, during a puja on the Ganges River in Varanasi; so not at all the Gothic context of this comic. But it also happened to me a few times in Gothic cathedrals in England. Once I even felt a pang of chagrin, that I was not a believing member of the Christian faith and did not have access to these experiences more often. 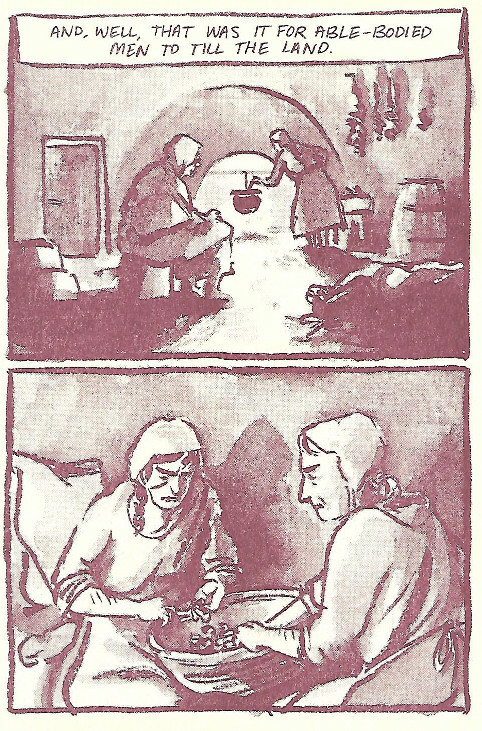 AH: I’m interested in the way you frame this story, because it would have been easier to use a physical ailment as the spark for pilgrimage – how did you decide to use the loss of men in the family as the initial crisis for the book? LM: This question unsettles me because I never explicitly thought of the narrative engine as being “the loss of men in the family,” though of course that does occur. When I was developing the story, I knew that the protagonist would be a young female peasant, and I did some light research on medieval pilgrimages to help make the story believable. I recall that one narrative option was that the peasant would be accompanying her master on his own pilgrimage, as an attendant; but I rejected that concept because I wanted to focus on her singular. You’re right that illness was a leading reason for peasants to go on pilgrimage, but I didn’t want this story to be about pitying her physical condition. Moreover, I wanted the character to be uncomfortable in her local church; that would establish her skepticism so that her reaction in the Gothic cathedral is a turning point. Someone going on pilgrimage to heal themselves would probably have believed in the miraculous propositions of the medieval Catholic church, so I didn’t want her situation to suggest that she was already susceptible to mystical experiences. Because of the traditional family and labor structures of medieval serfs, in order to provide her with the chance to even consider pilgrimage, I had to create a disturbance that would allow her to take agency. Since I decided it would not be illness, it was a disturbance of that traditional family structure. AH: As a related question, Enter, Holy Pilgrim confronts the historical lack of rights and privilege of women in Europe. How do you view the parallels between that time and those that still exist in current society, and how do you think Enter, Holy Pilgrim addresses them? LM: I did not spend a lot of time thinking about parallels between the medieval setting of my story and contemporary times with regard to women’s rights. However, I knew that writing a story about a protagonist who feels helpless, unable to connect to the locally prescribed source of solace, and who is abused at societal, economic, and individual levels would be relevant and interesting to today’s readers. Moreover, I wrote this narrative just after finishing work on a graphic novel about a young woman processing war trauma, grief, and sexual abuse, and I think those themes bled into the way I constructed this story and its protagonist. 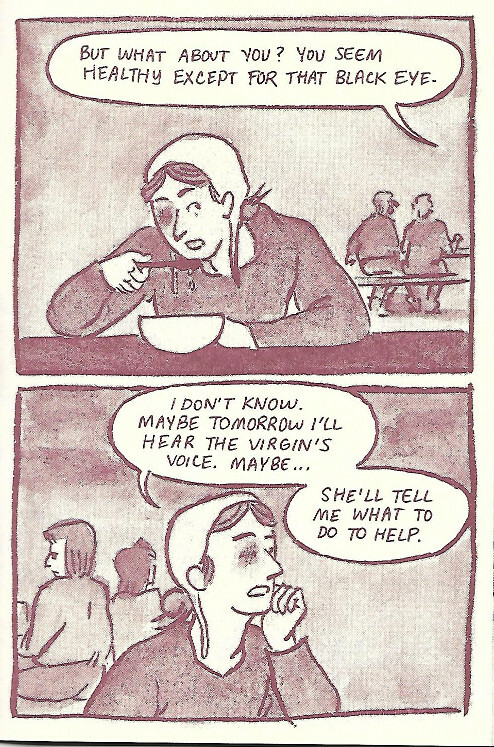 In a 24-page comic, I did not have much room to develop a complex character and backstory, so I tried to inject the beginning with many small but undeveloped indications of the systems and abuses at work in her world. The lack of development may be to my advantage because without too much specificity, a reader today could understand the protagonist’s situation as similar to her own. Moreover, it is still true that in many situations, women only assume agency in the absence of a directing paternalistic or male force. I think there has been progress in the Western world to encourage women to assume agency over their lives without the trigger of “losing the male,” but that progress is not evident in other parts of the world. Physical and sexual servitude remain contemporary problems, and as the primary demographic in many of the industries in which those kinds of servitude still exist, women are the ones suffering. I was very aware when writing this story that the external trappings of the protagonist’s lack of rights were cis, white, and Euro-centric; but I hope that readers cut through those details to connect to the protagonist on a level that acknowledges their common experiences. AH: It’s interesting to hear cartoonists talk about how they develop characters. Is the development process you mentioned for Enter, Holy Pilgrim unique to this book? To my reading, you created a complex character by omission. You give hints about her life that lead the reader to their own conclusions. LM: I suppose that using a process of elimination to decide how to situate the character was unique; but I think I have tried to be more suggestive than expository in previous stories. In Drawing Antonioni, for example, I purposefully limited the reader’s understanding of the protagonist’s life to the lens of his project examining the Antonioni movies. I think this makes sense because many of my comics are motivated by themes or ideas I want to share or explore, rather than by the desire to explore and develop a character. That being said, I believe I have much to improve in the way that I present characters through omission, and have yet to attain the subtlety I would like. AH: A theme of Enter, Holy Pilgrim that resonated with me was the idea of personal wholeness or wellness not being just wrapped up in a person’s physical wellness. There’s a juxtaposition between what the characters at the near-end of the book talk about and what is desired/needed. Does that concept of personal wholeness resonate with your view of the work? LM: Yes, I suppose it does, though with regard to my own personal wellbeing I have struggled with the separation of mind or mental/psychological sources of wellbeing, and body, or physical sources of wellbeing. It is easier for me to see how the two relate to one another in others than in myself. 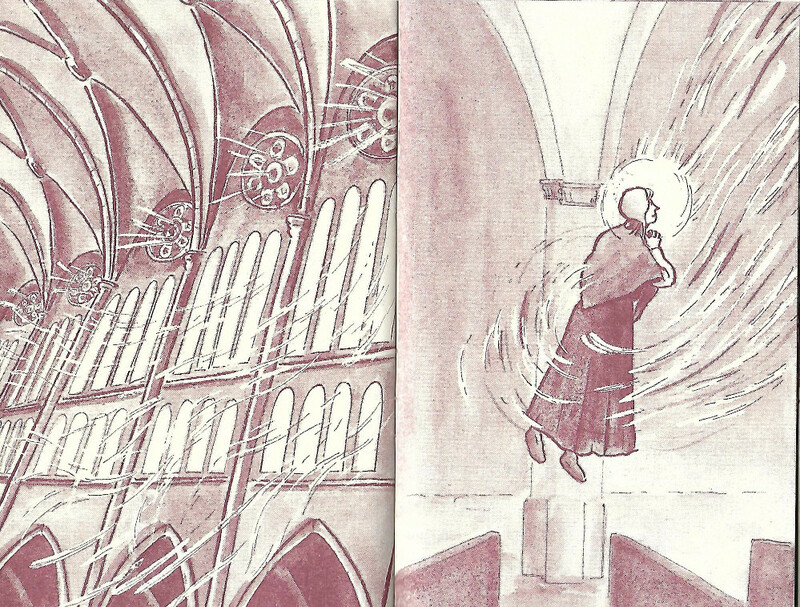 In fact, the protagonist’s experience in the Gothic cathedral at the end of the story illustrates how simultaneous sensory or physical stimuli and spiritual or mental feelings can bring those two streams of being together. This is exactly the kind of union that I wish I could experience more frequently. Extraordinary moments combining sensory and emotional sensations break down the barrier I sometimes perceive between physical and psychological wellbeing, and remind me not to compartmentalize the two. AH: It seems like from the back matter of the book that there’s some personal conflict you’re dealing with in Enter, Holy Pilgrim. The book contains a quest for spiritual guidance and assurance, and in the back matter you say you’re hopeful for a spiritual experience as well. Spirituality is a deeply personal space, so I don’t want to overreach, but do you think you were searching for something with this book, or trying to define your spiritual experience? LM: This book was inspired by, responding to, and an attempt to describe for others, a handful of experiences I had in Gothic cathedrals and other spiritual spaces. Those experiences were instrumental in expanding my understanding of what the spiritual is and how it can be experienced as a sensory-triggered reaction in the brain. As an atheist, my personal experience of the spiritual helped to cultivate my empathy and understanding for individuals who believe in deities and participate in organized religions. Those episodes also awakened me to the fact that spirituality needs no connection to deity or religion to be a part of your experience of life. My comment in the back matter about desiring to have more of these experiences was perhaps flippant, but over the past few years, I have not felt so susceptible to that kind of spiritual moment. For whatever reason my life circumstances and mental states have gotten in the way, and it would be nice to stumble into another sensory-spiritual moment to help to reset my understanding of myself within the universe. On a broader note, if you read the protagonist’s search as one for guidance, that is something that plagues me as well; I repeatedly feel incapable of making decisions about my own life, paired with a lack of mentors or guiding voices who I trust to be rational. AH: It’s interesting to hear you say that your comment on the back matter was flippant. I assumed that you were being earnest. That assumption probably says more about me as a reader and a critic than anything else. AH: I’m also curious about how it feels to be working in this vein, and how seemingly vulnerable it makes you – could you talk about that? LM: I do not feel that the Ley Lines story makes me vulnerable, perhaps because I do not have personal religious beliefs tied into my understanding of and engagement with spirituality. I very much enjoy discussing my spiritual experiences, to share them but also to invite others to share with me how they understand the spiritual and have experienced it in their lives. I’m a very sincere person and perhaps I share too much of myself in general; but I think that this kind of sincerity, when it is used to drive a story, can pull a reader in and forge a strong connection. It is my general MO when coming up with new stories, or at least, it is the hope that permits me to keep mining my personal experiences for stories when I make my comics. AH: This brings up a theme of our conversation here, the search for the spiritual absent any formalized religion. You’ve had these spiritual moments inside places specifically designed to create those experiences. Do you think making Enter, Holy Pilgrim, made you examine that reaction at all? LM: To be honest, no, since I chose to limit this story to its specific circumstances. But outside of making this comic, I have connected my Varanasi and Gothic experiences to other moments I’ve had outside of religious spaces. The sensory basis of the experience is the same kind of physical thrill one might feel when listening to music or when experiencing a chill during a fever. I don’t think it’s a coincidence that in the Christian and other religious traditions, some mystics who reported spiritual experiences also pursued physical or sensory deprivation. Of course a space devoted to religious ritual is more likely to deliver a level of sensory stimulus necessary to having a more extreme version of this physical thrill; and being in a religious space may push the mind to think of the feeling as a spiritual one. For me, context is important in coloring the experience; and this may be a reflection of my a-religiousness. After having my India and cathedral moments, I was visiting the Guggenheim museum in New York and felt something similar. It was an evening of free admission, and it was winter, and I reached the top of the spiral ramp and looked over the edge just after they announced they were about to close the museum. So when I looked down I saw a black-clothed vortex of downward movement. It was a strange combination of vertigo and exaltation; but it was not exactly a spiritual experience for me. Since this was just one experience, I can’t necessarily conclude that spiritual spaces cause me to label my experiences therein as spiritual, and non-spiritual places to not do so; but it would seem to suggest it. I guess my understanding of my own experience is pretty suggestible. AH: Do you think you accomplished what you set out to accomplish with Enter, Holy Pilgrim? LM: It was perhaps a fool’s errand to try to depict a spiritual experience using a single medium, and I’m not sure how strongly readers will feel what I have attempted to evoke in the comic. So I am not sure how I succeeded on that front; I haven’t yet heard much feedback from readers. I do think I accomplished my broader goal of bringing attention to medieval church architecture and in particular Gothic architecture, without going into any of the technical details of how Gothic introduced new paradigms for engineering and for Christian sacred spaces. On another level, I think that I succeeded in contributing to the Ley Lines series in a way that is different from some of the other creators who have also participated. AH: Turning back to the Ley Lines series – are there any books in the series that were particularly striking or affecting to you? LM: Warren Craghead’s Golden Smoke was impressive to me. To me his drawings can feel simultaneously impenetrable and attractive, which was a perfect vessel for his take on the art market world. On top of that, Warren’s style reminds me of influences in both the comics and fine art worlds, so that duality manifests on several levels. As the second Ley Lines book, it followed Annie Mok’s very personal exploration of her relationship with a single artist’s biography and work, so to me it suggested a great breadth of possibility for the series and made me excited to see what else was forthcoming. 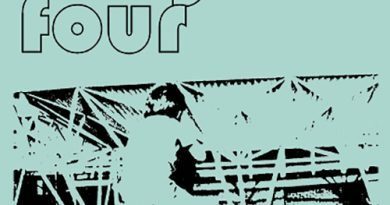 AH: After working within the confines of the Ley Lines project, what are your thoughts about comics interrogating the broader art world in this way? Would you like to see more of this kind of work? LM: Yes, I would definitely like to see more of this kind of work, and more comics that engage with other subjects in an exploratory or critical way. 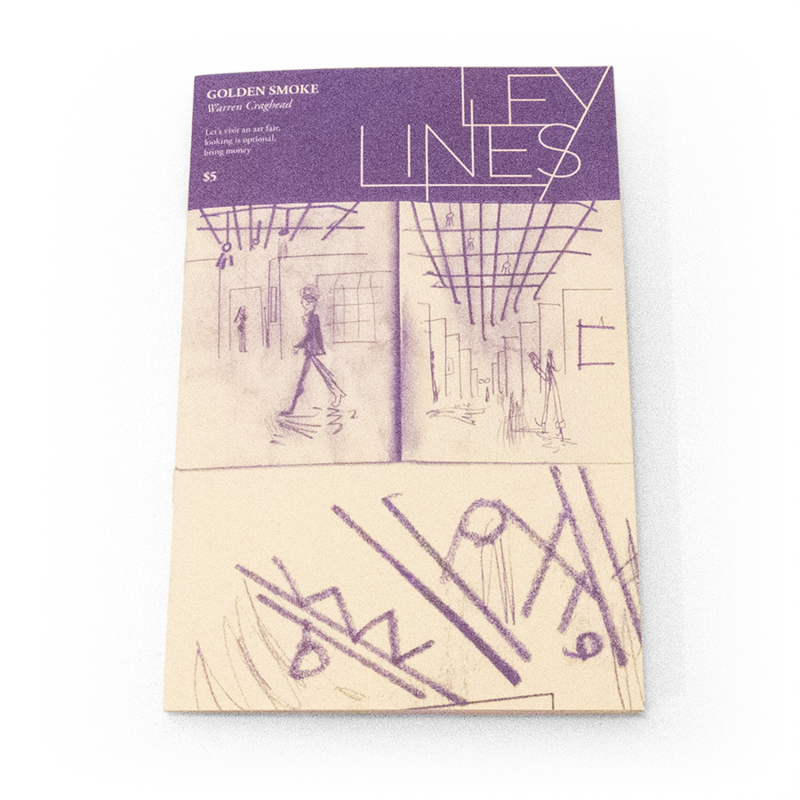 Projects like Ley Lines encourage creators to try new ways of using comics to communicate ideas or feelings. To me, it helps lead to questions about comics making, such as, what is creative nonfiction in comics form, does it exist and how can creators embark on new projects that define its characteristics? (By the way, I think that quite a few of the Ley Lines books address this question in different ways.) 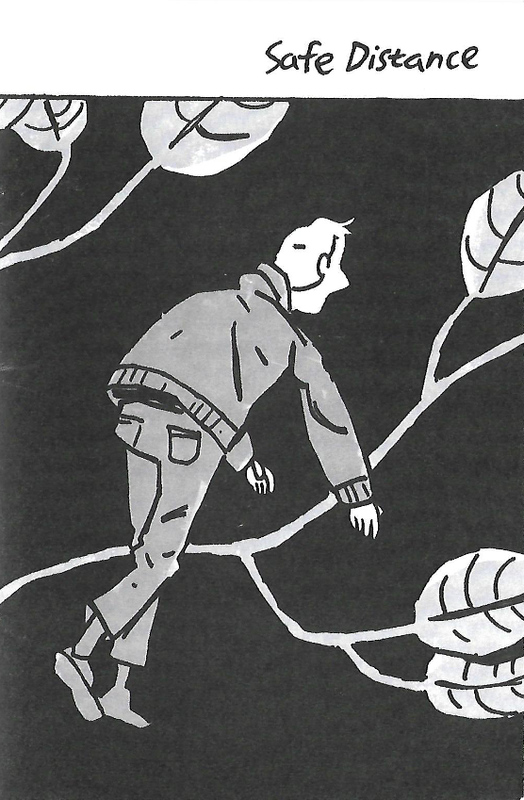 How about comics as a critical medium, outside of journalism or reporting? I took a traditional narrative approach to my project, that was a deliberate choice because I noticed quite a few of the other Ley Lines books were using non-traditional narrative or sequencing techniques and I wanted to differentiate my book. (I also wanted to improve my storytelling; for me the project was an exercise.) I put a lot of thought and experimentation into the idea of making my panel shapes echo the architecture I was examining, and ultimately abandoned the idea. However, following the confines of the project made me think about ways in which to bring the subject matter and the comics medium closer together. It’s often repeated, but restrictions on creative projects will lead to experimentation, and with more publishers or organizations doing what Kevin and L. are doing, I would be happy to see comics creators expand into new territory. Thanks again to Laila Milevski for taking the time for this interview. Readers can find Laila’s work at www.lailamilevski.com and buy copies of Ley Lines #9 Enter, Holy Pilgrim at http://leylines.storenvy.com. If you like the work I’m doing on Sequential State, please support the site on Patreon. Thanks!